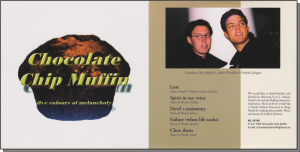 The five track CD album “Five colours of melancholy” released in 1998 by Chocolate Chip Muffin, Fredrik Lyhagen and Johan Windahl, is the result of a quite a few years of fiddling with the guitar, song writing and rock stardom dreams. In the months leading up to going into the studio we lived in different countries so the preparations were tricky but in February 1998 we finally started recording at MegaMusik in Helsingborg with the help of sound engineer and producer Einar. And damn was it a commercial success!! After reassuring family and friends that we do have a happy and optimistic outlook on life despite the lyrics the successes started rolling in, one after another. Sales sky rocketed in the first month, all family members bought two copies each, Fredrik’s grandmother bought five copies and a distant relative of Johan bought half a case to keep birds away from the strawberry fields. The rest were sent to select music labels and radio stations in Sweden. Approximately two months after the release we received a refusal letter from one of Sweden’s most influential artists, Ben Marlene of Trance Dance and at the time the CEO of Jimmy Fun Music. In 2008, after our 4756th letter, the world run out of music labels. Still today, Ben Marlene’s autograph is the closest we’ve come to rock stardom.